As you contemplate relocation to a safe area you should carefully consider what threats you are seeking to mitigate. I cover the full range of threats in Strategic Relocation—including some very serious ones that few have on their radar (a future nuclear world war with Russia and China, for example). In your assessment you need to consider many competing factors, including acceptable climate, distance to town and needed services, neighbors, physical safety from potential refugees and lawlessness, and how to do all this while maintaining your financial lifeline. —Not an easy task. Both Todd Savage and Nick Matthews of Survival Retreat Consulting (SRC) and I spend a lot of time with our separate consulting clients trying to balance out these conflicting needs of safety and security with location and convenience during good times. For most people, having a full time residence/retreat close to a small or medium sized town satisfies most of their criteria. Others, who need to be closer, or in town for work, should establish a semi-rural suburban residence for convenience and a separate retreat or rural farm for ultimate safety. The more rural you are, the higher the cost of building, maintaining equipment and commuting to civilization—and, the higher your expenses for services including utilities, alternate energy and internet connectivity. The more your priorities emphasize closeness to a community, the higher your risks will be during a social meltdown, and the more precise must be your preparations to bug out to a separate retreat. So, as you see, there are always compromises in life, no matter if you spend $50,000 on your property or millions, there is no perfect property that will meet all your criteria. Focus on what’s most important for you, your family and/or group. My discussion this first week will be limited to the northern most counties of Idaho (Bonner, and Boundary counties), which constitute the true narrow panhandle of the state of Idaho. This area differs in important ways from the broader area to the south from Coeur d’Alene down through McCall, Id., which I will cover in another briefing. In many ways this northern panhandle of Idaho is one of my favorite areas in all of the United States because it combines distance from large population centers, good forestation at low altitudes, plenty of water for agriculture, and very low government regulation for building permits. If there is any downside, it is its far northern latitude that brings very cold winter weather, although there are noted microclimates in Boundary County. The occasional heavy snowfall, however, is clearly a benefit (as in all the Rockies), because that provides the reserve of water to grow fir trees, and fills the lakes and aquifers that abound in the area. This area has unique geographic features that determine the weather patterns. The Idaho mountains are close enough to the Pacific coastal areas that the panhandle receives waves of moisture from the Pacific Maritime flow during October through April when the storms are strong enough to push through and over the Rockies—giving northern Idaho constant cloudy and rainy weather—just like the Pacific Northwest. But during the late spring and summer, those storms are weaker and reach the Idaho Panhandle less often yielding very nice summer weather. The other great feature of this area, and a product of the adequate rainfall, is the predominance of pine and fir forests at low elevations, which is a much sought after feature in my retreat philosophy, not only for beauty but for creating a private homestead. Let’s discuss this area in terms of convenience and amenities. If you’re in need of providing outside extracurricular activities to children (or adults), locate near the town of Sandpoint in Bonner County. If you choose the larger city to the south (Coeur D’ Alene), in Kootenai county—which has the most to offer—be aware that there is much less security, more building regulation, and more much crime as well. Sandpoint offers excellent skiing in the winter and spectacular boating and fishing on Lake Pend Oreille in the summer. It’s important to thrive when you relocate, as well as survive. From a security standpoint, Boundary County to the north is even more remote. The main threat from social unrest and the resulting refugee flows comes from I-90 which will channel people from Seattle into Spokane—the largest city in Eastern Washington, and right on the Idaho border. From there, it will channel refugees into Coeur d’Alene. 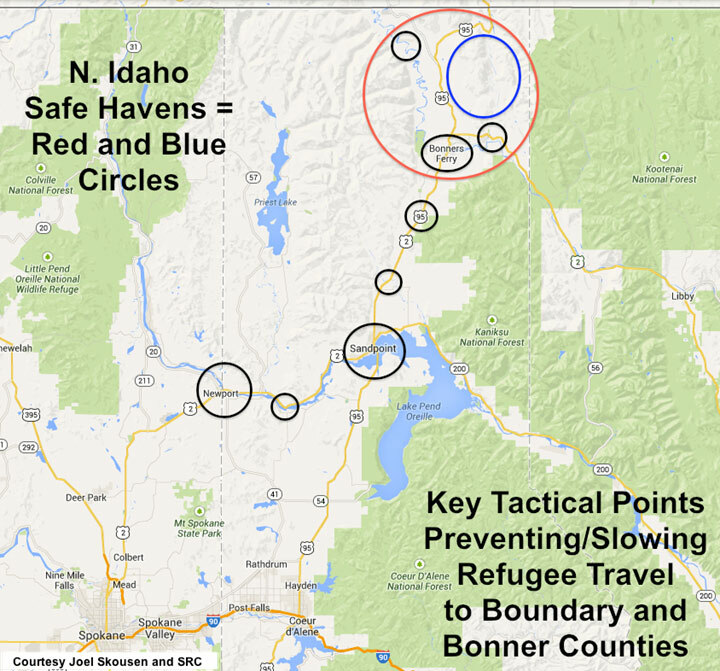 Fortunately, there are a eight key tactical points that may slow or stop travel northward to Sandpoint and then to Boundary County, including a number of bridges SEE MAP. Remember, that it is actually beneficial for your safety to have numerous towns between your location and major cities, to absorb refugees. Northern Idaho has an abundance of water from streams, creeks, rivers and lakes; you can’t go wrong searching for a great property there. However, there are several spots within these counties due to geologic factors that don’t provide economical well water—either low flow or too deep (very costly). For example, the Paradise Valley bench outside Bonners Ferry is a spectacular spot, for both sun exposure and food production, however there is a layer of silt that can be as deep as 700 feet before hitting the water table. The local community has tapped into a large aquifer on the bench and built a community system that is fed by this aquifer. These seem to work fine and the only improvement you would have to consider if you tap into the community system is to install a cistern to store water, or drill your own well if funds are available, for back up. There are some areas up the Upper Pack River Road just north of Sandpoint, that have very low producing wells (1/4 gallon per minute) on one side of the road and the other wells are at acceptable flow rates. This not to say not to look in these areas, just ask your Prepper Realtor or Consultant to pull well logs for the surrounding properties before your final property selection and subsequent purchase. First, along District Two Road just north and running east of the bridge in Bonners Ferry is some of the most fertile ground in the county along with the North Bench and Kootenai River bottom heading towards Porthill, Idaho along the Kootenai River. You will have to ascertain your risk level of being about 63 miles down stream from the Libby dam (which has had previous seismic issues) and the rate of flooding should the dam give way for any reason. There is a spectacular retreat for sale at the end of District Two Road. It features varied terrain from cliffs to many acres of fertile and defensible ground, and 4000 feet of Kootenai River frontage. This spectacular retreat is located 2 miles past a locked gate at the end of the county road. 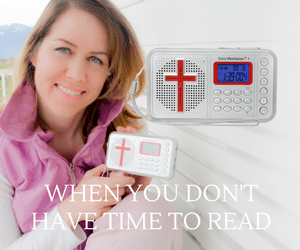 The Point Retreat will meet even the most discerning Preppers retreat shopping criteria. As the Kootenai River runs north the large fertile basin on both sides of highway 95, as it heads toward the Canadian border. The Eastport area is higher in elevation and the growing season is shorter, although there are several retreats just south of Eastport that have spectacular water and defensibility. Staying on the west side and going north on Highway 1 to the Porthill border crossing is some of the most spectacular views and property in all of Boundary county. The growing season on the North Bench near Porthill is better with good sun exposure and abundant water from spring runoff from the mountains. Several such gravity fed springs make up a local community water system in Porthill that is gravity fed to the under 100 residents. The next area is the Katka Mountain region, several miles east of Bonners Ferry and up the mountain on Two Tail Road. There is abundant water on most properties and they are very defensible, with only the Katka Mountain Road as ingress/egress from that area. The Meadow Creek Road region just off Highway 2 and heading north to the Canadian border is a wonderful retreat area as well. Another recommendation is north of the Kootenai River on Old Highway 2 Loop road area just east of Moyie Springs, Idaho. However, properties are few and far between on both Meadow Creek and Old Highway 2 Loop, and when the good Prepper properties come for sale they go quickly. Staying north of the Kootenai River in Bonners Ferry is highly recommended, if possible. Give United Country – Strategic Relocation Realty™ a call, as they are my recommended experts on Rural Sustainable Properties in Northern Idaho and are very helpful. In Bonner County, the Selle Valley area is a wonderful location known for excellent growing, sun exposure and on most properties, live year round water and some springs, depending upon property location. This is a great area for those that may want to be closer to town for various reasons and enjoy a bit more interaction in the town of Sandpoint (pop 9500). There are a lot of higher altitude areas that are not suitable for growing, but make excellent high-security retreats. Be aware that some snow levels can reach over 20 feet plus, so be sure to ask neighbors as you identify properties and pay attention to elevation and snowfall records. It’s very important to seek advice about winter weather in North Idaho, as slight variations make a huge difference. The lowest elevation in the County is at the Porthill river crossing at about 1754 feet above sea level, which has only slight to moderate snowfall—with allot of rain in the winter, like downtown Bonners Ferry. But just a hundred and fifty feet or so of elevation change can change that rain to snow and it’s a different ballgame. Sandpoint offers a wide variety of multi-cultural restaurants and entertainment venues. It has an old town atmosphere and even has a local city beach. Security concerns during good times are limited to petty crimes with violent crimes few and far between, as you would expect from a small rural town anywhere USA. For a post-collapse scenario, there is still the Sandpoint Long Bridge over Lake Pend Oreille and the Newport Bridge to help slow and stop any moving threat. These northern two counties of Idaho are very conservative and libertarian, and differ significantly from the politics of Coeur d’Alene to the south which is fairly liberal, having been a retirement destination for liberals from California, Oregon and Washington. They bring with them their acceptance of government control and thus Coeur d’Alene city and Kootenai County have the full range of building and planning restrictions just like other large cities. In stark contrast, in both Bonner and Boundary counties to the north you don’t have to submit your formal house plans to the county. What is required is very minor—a Residential Placement Permit, which requires a $35 fee. The application does not require the divulgence of your building plans, so your safe rooms and storage will not be public record and subject to scrutiny. It simply asks among other mundane items for the ‘footprint’ of the buildings and distance to property lines. Before beginning construction or installation of a residential structure, it is necessary to make application for a residential placement permit, which is pretty benign. Boundary County wants to ensure that the parcel meets the minimum lot size for the zone district in which construction is taking place or that the parcel is a legal non-conforming lot of record, that set-back requirements are met, that the property where the home is being placed does not lie within wetland or flood zones identified by the Federal Emergency. In Boundary County, this is literally a one-man show: Walk in and talk to Dan Studer (208-267-7212) and chat about the parcel and placement before making the one page application. It’s really that simple. Subdividing Property, if you need to, is a simple process as well, depending upon the parcels location and current zoning. A simple subdivision application (to divide an un-platted parcel into five or fewer parcels, each meeting minimum parcel size within the zone district and each with approved driveway access to an existing public street or road) in Boundary County can still be HAND DRAWN on a one-page application! However, in the last 10 years the county has adopted quite an extensive set of rules and regulations for smaller parcel subdivisions, and if your property falls into the ‘subdivision ordinance’, it’s best to do your homework before making a larger land purchase in hopes of splitting it up. If you plan to build a fully sustainable retreat (off-grid, alternative energy) and wish not to have a state inspector in your home, you can purchase your supplies and then hire a local state certified contractor to do the install and sign-off for you. This applies to your plumbing and septic as well. Bonner County, Idaho (Sandpoint), is very similar in requirements, with several additions, which will impact those of you that intend to build safe rooms and storage in your new home. First, Bonner County requires a Building Location Permit with Diagrammatic floor plans and elevations of the structure in sufficient detail to identify the size and use of all components and floors of the structure, stamped by Panhandle Health (septic permits). But, as I point out in my design book on the Secure Home, you simply show a room labeled “storage” on the plans—nothing else. This is an easy solution if you have found a great parcel in Bonner County. The entire region is very beautiful, with lots of mountains, lakes and rivers for recreation like camping, mountain biking, hiking, hunting and fishing. Soils range from sandy loam to clayish, and are of sufficient depth in most areas that building a basement is not a problem. There are some areas that are very rocky, so be sure to ascertain this before any purchase. It is so important to have concealed basement space in a retreat that I never recommend any piece of property that doesn’t have good basement potential. I find most of the people in the area open and friendly, generally, with a strong mix of religious conservatives and libertarians, but as in all rural areas, you find a few strange ones. I would be remiss not to mention that this area was home to the Aryan Nations Neo-Nazi compound of Pastor Richard Butler in Hayden Lake. Although I wholeheartedly disagree with their racist beliefs, I did interview him and his cohorts many years ago and came away with evidence that this was an infiltrated government operation meant to tarnish the reputation of all conservative dissidents everywhere, just like the Ruby Ridge fiasco which also happened in Boundary County. Butler died in 2004 and his followers were run out of the county by a lawsuit and the compound was torn down. I only mention this in an otherwise very positive assessment because people ask me about this fairly often, and don’t want my readers to feel cheated that I didn’t tell them what I know. Even though Butler and his Neo Nazis are gone, one of Butler’s followers, Shaun Winkler, purchased another piece of timberland recently in the Hoodoo Mountains and is trying to resurrect the movement. The good news is, however, that his attempt is looking like a failure. He’s only got a handful of followers, little money, and his contract for the land is reportedly being foreclosed on, thankfully, they should be gone forever soon. Realistically, this kind of extremist association, often driven by government agent provocateurs, is something we have to deal with in any highly sought after retreat area—and one of the prime reasons I caution against joining formal survivalist or militia organizations that draw the attention of government. Build your own informal network of people you trust. Summary comments: Idaho is one of two 5 star (out of a possible 5) rated states in Strategic Relocation. Northern Idaho may be a bit too far away as a pure bug-out retreat location for those having to keep their main residence in cities more than a day’s drive away (not counting private pilots), but it is ideal for those looking for a new main residence or retreat combination in the safety of the far west. You will be surrounded by spectacular beauty, good access to moderate sized cities without urban blight, and be amongst a significant concentration of like-minded people with family values. Also of high importance—the Pacific Northwest, in general, is very open minded, so their acceptance for quality newcomers is high. Be sure to check out www.StrategicRelocation.com™ the new Survival Property For Sale Site we started last week for new retreat listings. Pass the word; let’s bring aboard you favorite Prepper Realtors and FSBO properties from around the globe to this new venue! I’m proud to announce that Nick Matthews has been named the new Worldwide Operations Manager for Survival Retreat Consulting as they expand outside the American Redoubt. Nick brings years of experience to the SRC team as an officer and a Bronze Star recipient from his combat action overseas with the U.S Army. You may see Nick’s bio HERE. Congratulations Nick. When you’re ready to relocate you can explore your options at the strategic relocation For Sale By Owner web site and find nationwide real estate listings that include survivability ratings and everything a prepper, homesteader, or survivalist might need to help make an informed decision. In addition to top-notch analysis and guidance, we recommend visiting the Strategic Relocation Blog to find a host of essential service offerings from U.S.-based companies like Iron Edison (producer of leading solar energy systems) and Ever Logs (manufacturer of concrete ballistic homes). Many believers around the United States have it on their heart to move, but they just don’t know where to re-locate. Are you in that very position, or know people who are? Have you ever considered IDAHO? 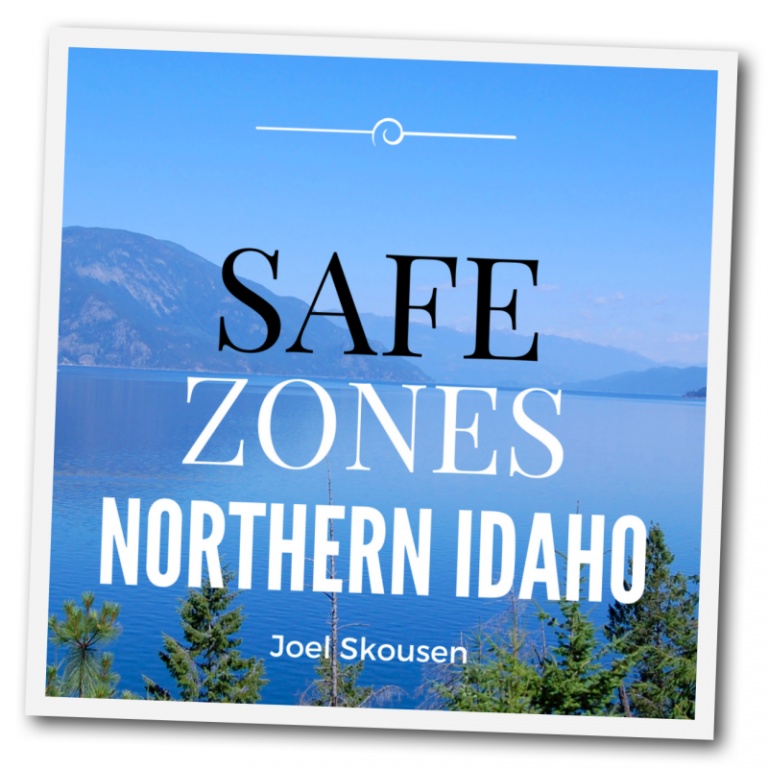 Joel Skousen happens to be an expert when it comes to high security residences and retreats. In his book, Strategic Relocation–North American Guide to Safe Places, he guides people through the process of developing contingency retreat plans for when a major crisis strikes. This very well known book has a 3rd Edition. In the latest edition, it features a newly added section on foreign re-location possibilities. If you are considering moving overseas, this new addition had nearly 3/4 of the content re-written. The newest version is expanded to 349 pages. If you are in the process of looking for a home or retreat we urge you to visit StrategicRelocation.com, the fastest growing For Sale By Owner real estate web site on the internet. Here is PROPHETIC Invasion map detailed by Chuck Youngbrandt which was found on his facebook page. What he sees lines up with the safe zones which many say are in Washington, Idaho and the Ozark Mountains. I am not sure about Northern Florida. I haven’t heard yet about a safe zone there. Isn’t this interesting these locations line up with what Joel Skousen is saying?